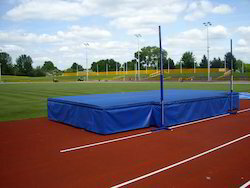 Providing you the best range of pole vault pits and high jump landing pits with effective & timely delivery. We manufacture, supply and export Pole Vault Pits using high quality raw material that is sourced from trusted dealers. We use high density polyurethane foam covered with non-tearing and non-abrasive Vinyl Cover to make these products.All standard sizes available here and we also provide solutions to our customers as per their requirement. Mattress can also be designed as per customer's requirement and preference with a complete Customized solution. We are highly appreciated for our High Jump Landing Pits. These mats are flexible and durable and the raw material used to manufacture these pits is high grade and sourced from trusted dealers. Made of high density polyurethane foam covered with non-tearing and non-abrasive synthetic cover. 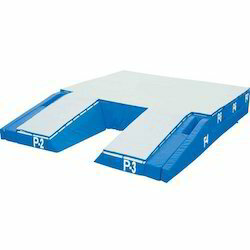 The High Jump Landing Pits we offer are non tearable, water proof and made up of thick fabric. These are available at reasonable price.